Fred Yslas and his two children Freddy, 3, and Ellianna, 5, search for the queen in the hive at the Western Colorado Beekeepers Association's booth during the Honey Bee Festival in Palisade on Saturday, April 13, 2019. 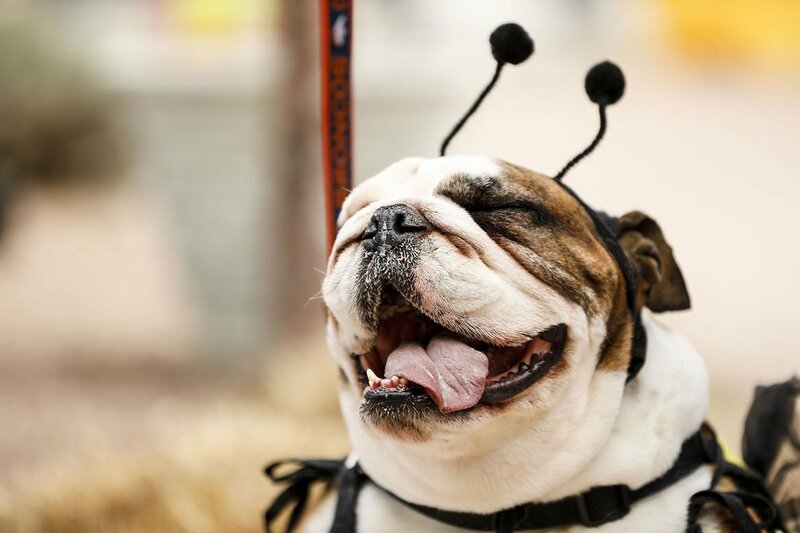 Bruiser the bulldog sports a bee costume during the Honey Bee Festival in Palisade on Saturday, April 13, 2019. Congratulations to Mike Wiggins and Erin McIntyre for their great adventure becoming new owners of the Ouray County Plaindealer. Their many years in the publishing business as both editor and reporter will give them a leg-up in this huge endeavor. It's Ouray's gain and The Daily Sentinel's loss. Good luck to you both. I watched CMU trounce the New Mexico Highlands football team 77-14 in 2017. Thank goodness NM scored a couple of second-quarter TDs! It saved CMU from having to apologize. We still haven't been refunded the illegal fee charged by GVD and they turned us into state collections for the year we refused to pay it again. Where's our refund? And clear up our credit GVD! I am so grateful for the city crews that provide the service that helps keep property tidy and uncluttered. How do we reward these people? Thank you to the city for including this valuable service in the budget! I find it amusing that the majority of valley residents who were so pro on more police and fire funding are also the first and loudest to complain about the speed limit changes throughout the valley. Give them more money and power and they will use it to collect more money and gain more power. I don't know how our Parks and Wildlife is getting away with making a person purchase a small game or other qualifying license in order to apply for a big game license or point. What if you don't hunt for these? I don't even buy a fishing license anymore, and I loved to fish. I haven't even been to a state park in over five years due to the poor fishing and cost. I know a lot of people who are not even applying for a big game tag this year. I hope our local restaurants don't see this and start making you buy an appetizer before you can order a meal. I don't want to be one of those newcomers that moves here and tells the natives how to conduct their business. But with respect to the field burning that's going on, if it needs to be done then so be it. I just don't see it being done anywhere else though. If field burning is essential to agriculture, then why isn't Iowa currently engulfed in burning fields and a smoky haze? Where can I pay a bicycle fee to shut the whiners up? I don't even ride but I'm tired of the whining about bicycles. I have to say it's a bit funny that the city of Grand Junction said yes to more police (there are after all quite a few already, and many of the policing challenges fall outside of Grand Junction city limits), but no to an actual, physical place for their children and themselves to enjoy physical recreation. Perhaps if the elementary school science curriculum had been updated since the mid-'90s, Grand Junction voters could have taken a more objective perspective on their city. Don't blame the infamous Ute Curse for folks not being able to leave the Grand Valley. Rather hard to leave when you work for a well-established retailer, and your only raise in 11 years is 10 cents per hour to bring you up to minimum wage. The town of Parachute generates 30 to 40 percent tax revenue from legal cannabis sales. The city of Grand Junction could easily support three or four shops spread across town. Hundreds of thousands of dollars going towards schools, infrastructure, etc. that wouldn't have otherwise been there. To the staunch prohibitionists: relax, the negative societal problems are minimal, and the issues are being worked on. Get on board! The 20 best cities to live in were just released. Grand Junction wasn't in the top 20. Must be the smoke, or the lack of a community center, or maybe just all the whiners. I am in favor of sharing the privilege of using the roads with cyclists IF that includes that they also follow all the responsibilities as well. This includes stopping (not hesitating) at stop signs, yielding where posted, signaling when turning and buying tags to help pay for their usage. How about it? I'm tired of hearing all the complaints about property owners burning their fields and ditches. As a native of GJ I grew up liking the smell, and people just need to remember that they live in an agricultural area where this is a common and necessary part of caring for your property. Quit whining about it or move back to where ever you came from. To quote a famous movie line: "I love the smell of burning fields in the morning, it smells like victory." Within the last week someone stole a 3-foot statue of Mary off our front porch. I am deeply saddened and my granddaughter is very upset that someone would do this. If you know someone who recently acquired a new concrete statue (unpainted and heavy), it is probably mine. You can't buy one like this in town. Just curious as to when voters approved pouring more money into the bottomless pit known as the convention center? Whose pockets are being lined from the work on this? Is the convention center really drawing people to GJ? Thank you to the many folks in our community who choose to ride bicycles or walk rather than pull the car out for every single outing. You are saving our roads from much wear and tear and reducing air pollution.